The fifteen day of Chinese New Year is called Lantern Festival. Lantern Festival Day is the last day of Chinese New Year celebration. On this day, we traditionally celebrate with lanterns and dance balls. Families and friends get together to have another feast before going back to work. 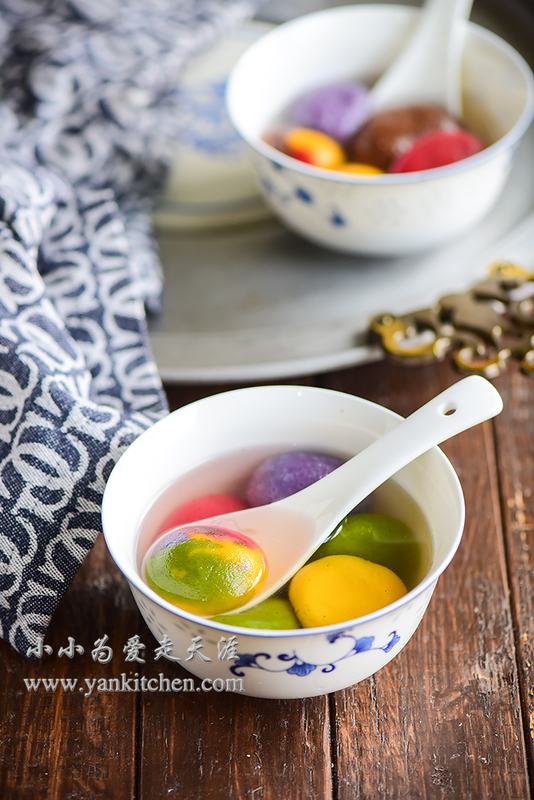 One of the traditional foods served on this feast is sweet rice cakes balls. There are so many varieties of sweet rice cakes out there on the market that everyone can find his favorite flavor. As for me, I love black sesame filling the most. It is not difficult to make them at home. But I have been told many times that American people are not great fans of sticky sweet rice. That is interesting. If you are curious about rice cakes but don’t want to make them at home, go get one package in your local Asian grocery store. They are sold in frozen food aisle. The classic flavors are sesame, peanuts, red beans and jujube. There are roasted sesame seeds available. But I always prefer raw ones and pan roast them at home myself. Its flavor and scent are so much better and stronger. Shift raw sesame seeds a couple times. Heat a cast iron skillet on medium heat. Add black sesame seeds. Pan roast for several minutes. 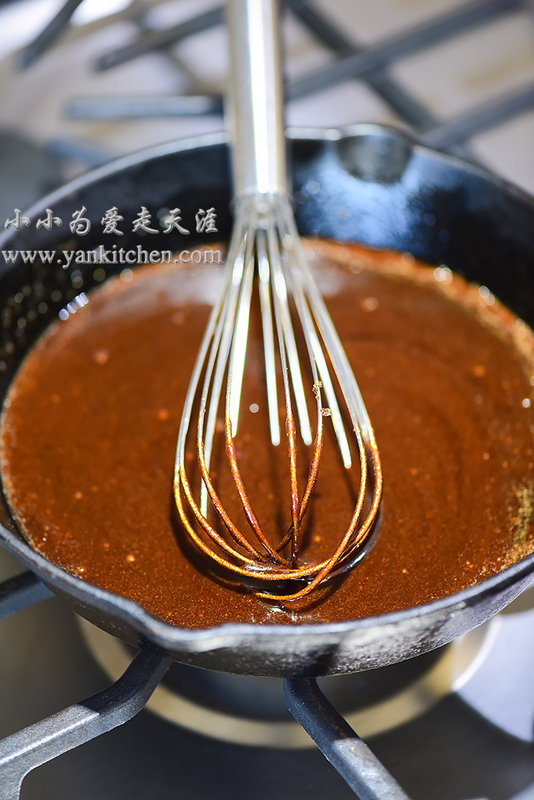 Stir with a whisk from time to time. I always add a pinch of white sesame seeds to the pan too. When white sesame seeds are starting to change color to light creamy beige, I know they are done. Refrigerate for at least 4 hours. The sesame filling will be harden when chilled. Divide the filling into small pieces and roll into tiny sesame balls. 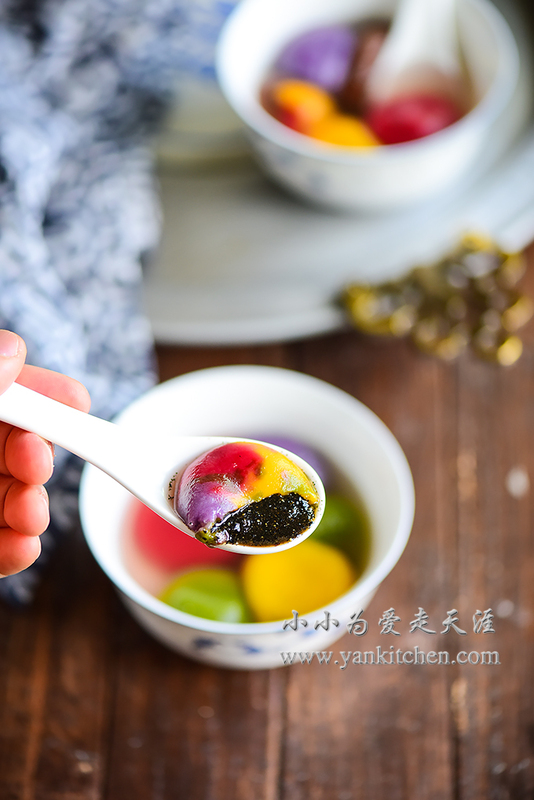 When waiting for the sesame filling to chill, I prepare five pieces natural colorful sweet rice cake dough. They are in fact quite easy to make. Just mix vegetable puree, water, a few drops of vegetable oil and sweet rice cake flour and knead. The purple color comes from purple sweet potato; red color comes from beet puree; yellow one is from carrot puree; green one is from spinach puree and the brown one is from coco powder. Divide the dough into small pieces. Press each piece flat; add black sesame filling; wrap it up and roll into sweet rice cake balls. Fill a large pot with water. Cook over high heat until the water boils. Add sweet rice cake balls. 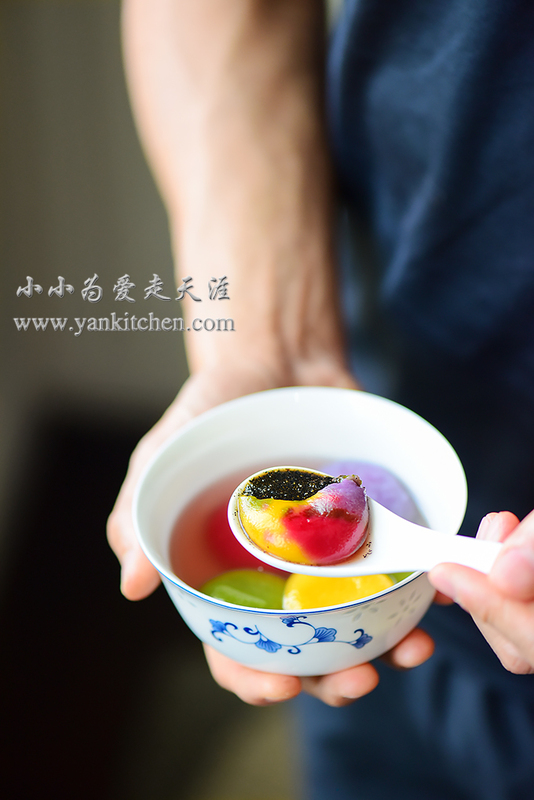 Cook on high heat until sweet rice cake balls float.